Upon arrival in Bangalore, Transfer to the hotel for comfortable overnight stay. Upon Arrival at Chennai/Bangalore/Tirupati, You will be received by our representative and Transported to Hotel in Tirupati. Check-in to the Hotel. Relax for a while. A Sightseeing of Tirupati is optional by Evening. Overnight Stay at Hotel in Tirupati. Today after breakfast, proceed for the Tirupathi sight seeing which includes the Sri Padmavati Samovar Temple, Tiruchanoor, Sri Govindarajaswami Temple, Sri Kodandaramaswami Temple, Sri Kapileshwaraswami Temple, Sri Kalyana Venkateshwaraswami Temple, Shrinivasa Mangapuram. By Afternoon Proceed to Bangalore. Overnight Stay at Hotel in Bangalore. 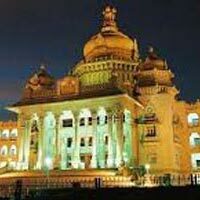 Today After breakfast proceed on a sightseeing trip of Bangalore, Visit the City of Lakes, Parks and Gardens. Visit the Vidhana Soudha, Lal Bagh, Cubbon Park, Bangalore Fort, Tippu Siltan’s Summer Palace, Bangalore Palace, The Mayo Hall, Attara Kacheri, Bull Temple etc. Later by evening, proceed to Mysore. Overnight Stay at Hotel in Mysore. Today After breakfast proceed on a sightseeing trip of Mysore, Visit the Mysore Palace, The Brindavan gardens, Jagmohan Palace, the Chamundi Hills, Lalitha Mahal and St. Philomena’s Church. Later proceed to Bangalore. Overnight Stay at Hotel in Bangalore. After Breakfast ,check out of the hotel and proceed to Nandi Hills (65 Kms).Later Return Back to Bangalore Airport for your return Journey towards Delhi. Tour Ends.